Soccer warm up drills are used by individual players training to improve the skills, or by a group of players or a club team. It doesn't matter if it is one player, or a group of players. It doesn't matter if its the big soccer field, or just a piece of open space. Warm up drills for soccer can be done anywhere. This warm up drills is one of the most basic soccer drills used by different clubs for years. 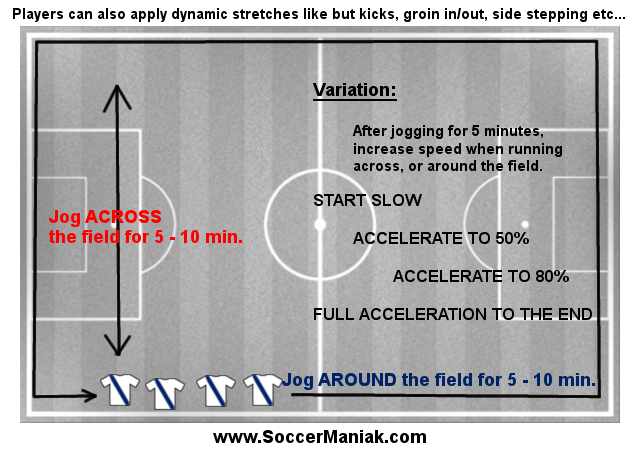 Jog down / around the field for 5 - 10 minutes at 40 - 50% pace. This is a good time for players to socialize, talk, and get to know one another through light jogging. After 5 minutes, players can include dynamic stretching while jogging on the field. Jogging is a great warm up drill to start the training with. Heart rate builds up, while muscles and the body warms up for the practice. Every player, no matter what the age or skill level, should jog around the field for at least 5 minutes before making heavy contact with the soccer ball. Jogging and adding direction change at a 50% pace will transform muscles from lazy state into athlete mode body. There will be less of a chance for injury after players do light jogging and stretching before kicking the soccer ball with power and pace. Below you will find more warm up soccer drills that you can use in training, or adapt and create your own warm up from the ideas below.